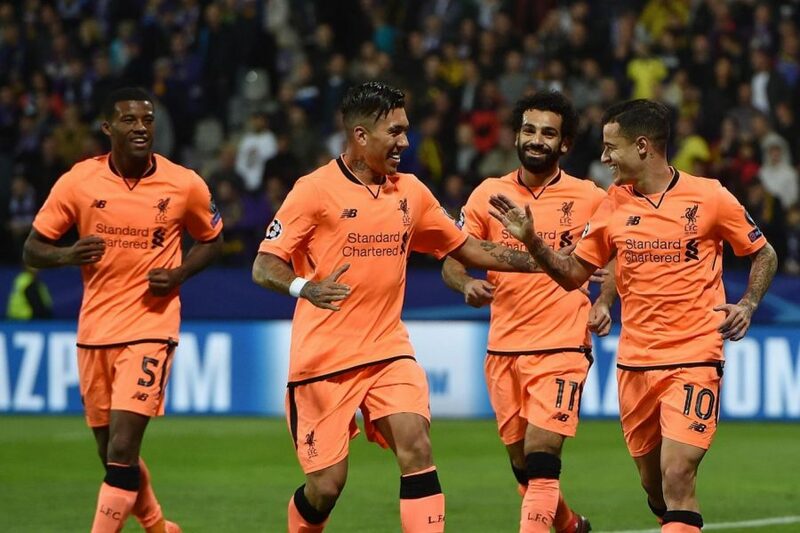 Liverpool breezed to their first Champions League Group E win of the season as they blasted past Maribor 7-0. The Premier League side needed a little more than three minutes to take the lead as Mohamed Salah jumped on to a loose pass and carried the ball into the box before crossing for Roberto Firmino, who dragged his back foot to turn the ball in. And nine minutes later Philippe Coutinho doubled the lead by volleying James Milner’s cross inside the near post. Maribor’s calamitous defending continued and Salah got on the scoresheet himself in the 20th minute after Roberto Firmino played him in on goal with a through ball. Salah then added his second goal five minutes before the break by turning in Alberto Moreno’s cross from close range, just beating Firmino to the ball. But Firmino did get his brace early in the second half by flicking on a header after a Coutinho free kick, and Alex Oxlade-Chamberlain came on to score a late sixth before Trent Alexander-Arnold made it seven in stoppage time. Despite only managing draws in the opening two games, Liverpool top Group E on goal difference above Spartak Moscow, who earned a 5-1 win at home over Sevilla. The Russian champions found the opening goal in the 19th minute as a pass into the middle deflected out to Andrei Eshchenko, whose cross was met by the head of Quincy Promes. Sevilla equalised following a corner on the half-hour mark, Simon Kjaer scoring with a left-footed volley after his original header was blocked. But Lorenzo Melgarejo put Spartak back in front by curling in a first-timed shot in the 58th minute, and Denis Glushakov added a third goal from a volley nine minutes later. Luiz Adriano netted the fourth on a 74th-minute counter-attack before Promes completed his brace in the final minute.